São Paulo state authorities say two gunmen opened fire inside a school in southern Brazil, killing at least six students and two teachers before taking their own lives. The shooting at the state school Professor Raul Brasil in Suzano, a suburb about 20 miles east of the city of São Paulo, happened around 8:30 a.m. ET Wednesday morning during a break between classes. Authorities said the two youths armed with guns and wearing hoods entered the school and began shooting at students. They then killed themselves. 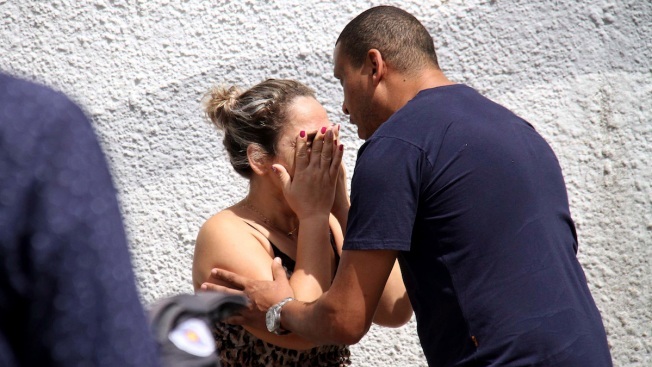 São Paulo Governor João Doria said 10 people have died, including the shooters, and at least 16 others were wounded. TV Globol reported that a police spokesman said officers were responding to reports of gunfire near the school when they heard screams coming from the school building and ran inside. It was not clear if the two incidents were related, officials said. Police said the shooters were former students at the school, TV Globo reported. Police identified them Wednesday afternoon as 17-year-old Guilherme Taucci Monteiro and 25-year-old Luiz Henrique de Castro. São Paulo's secretary of public safety, Joap Camilo Pires de Campos said Monteiro left the school last year due to "problems," but did not provide additional information. It was not known if Monteiro was expelled or withrew from the school. The school has about 1,000 students between the ages of 11 and 18 enrolled and 105 employees, according to 2017 census data. Latin America's largest nation has the largest number of annual homicides in the world, but school shootings are rare. Brazil's new President Jair Bolsonaro recently announced that gun ownership controls would be loosened.